For high end-to-end channel capacity, the amplify-and-forward scheme multiple-hop multiple-input multiple-output relay system is considered. The distance between each transceiver and the transmit power of each relay are optimized to prevent some relays from being the bottleneck and guarantee high end-to-end channel capacity. According to the proposed transmission environment coefficient, the path loss can be described in a new way, and then the distance of multiple-hop relay system can be optimized more simply than the original one. However, when the system has no control on media access control (MAC) layer, performance of the system deteriorates because of the presence of interference signal. Thus, the specific transmission protocol on the MAC layer for multiple-hop system is proposed to reduce the power of interference signal and to obtain high end-to-end channel capacity. According to the proposed transmission protocol on the MAC layer, the system indicates the trade-off between the end-to-end channel capacity and the delay time. The end-to-end channel capacity of the outdated channel state information system is also analyzed. Multiple-input multiple-output (MIMO) relay systems have been discussed in several literatures [1–3]. Additionally, ergodic capacity of the amplify-and-forward relay network is discussed. The links between the relay transmitters and relay receivers are assumed to be parallel  and serial [5, 6]. The end-to-end channel capacity based on the different number of antennas at the transmitter, the relay, and the receiver also has been evaluated [5, 6]. However, the number of relays considered there (in [5, 6]) is only one. When the number of antennas in relay is less than the number of antennas in the transmitter and receiver, the capacity of MIMO relay system is lower than that of the original MIMO system. Moreover, when the number of antennas in relay equals that in the transmitter and receiver or more, the MIMO relay system can provide the same average capacity as an original MIMO system. In other words, although the number of antennas in relay is larger than that in transmitter and receiver, the capacity of MIMO relay system cannot exceed the capacity of original MIMO system [7–10]. Therefore, in order to achieve a high channel capacity, the multiple-hop relay system is considered [11, 12]. However, in these papers, the interference signal is assumed to be absent; the performance based on a transmission protocol that only has two phases is analyzed, the signal-to-noise ratio (SNR) at the receiver is assumed to be fixed, and the location as well as the transmit power of each transmitter are not dealt. 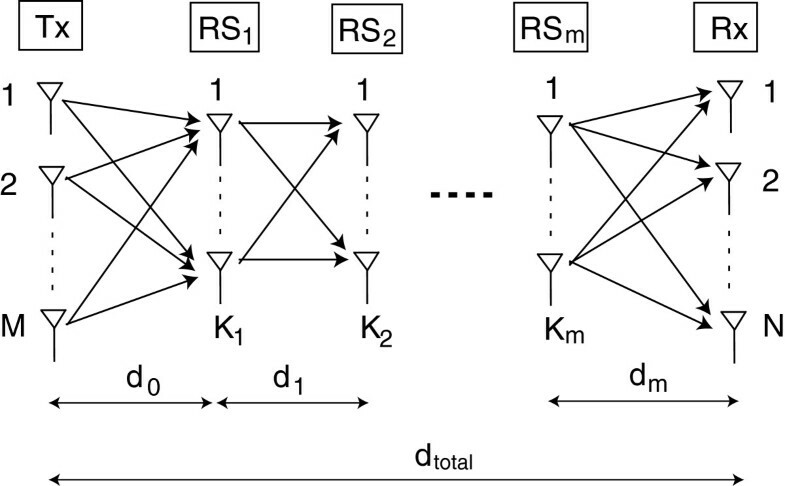 In the multiple-hop MIMO relay system, when the distance between the source (TX) and the destination (RX) is fixed, the distance between the TX to a relay station (RS), RS to RS, and RS to the RX called the distances between transceivers, is shortened. Consequently, according to the number of relay and the location of the relays, the SNR and the capacity are changed. Hence, to achieve the high end-to-end channel capacity, the location of each relay, meaning the distance between each transceiver, needs to be optimized. We have analyzed the performance of half-duplex multiple-hop relay system with the amplify-and-forward strategy  and decode-and-forward strategy . However, the multiple-hop relay system has been optimized on the physical layer, and the transmission of each relay is assumed to be controlled accurately. In this paper, the transmission protocol on media access control (MAC) layer is proposed and the multiple-hop relay system is optimized on both physical and MAC layers, the PHY-MAC cross-layer. Additionally, the system is analyzed when the outdated channel state information (CSI) at the receiver is taken into account. The channel capacity in this paper is the ergodic channel capacity. The rest of the paper is organized as follows. We introduce the channel model of perfect CSI multiple-hop MIMO relay system in Section 2. Section 3 is the analysis of the system that has interference. The specific access control on the MAC layer is described in Section 4. The end-to-end channel capacity of the outdated system is analyzed in Section 5. Finally, Section 6 concludes the paper. 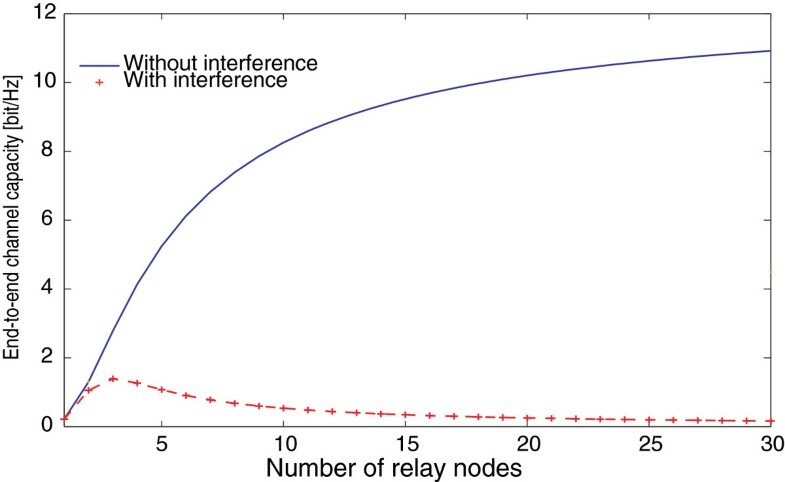 We assume that there are many relay nodes, i.e., mobile phone and personal computer, arranged in a straight line from the base station to the receiver. When the receiver wants to receive the information from the base station, it transmits the request message to the base station via the relay node. After receiving the message from the receiver, the relay node detects the CSI and adds its location information into the message and transfers to the other node. When the base station receives the request message, it optimizes the distance and the transmit power based on each transmission protocol of the MAC layer. According to the location information of each relay node added into the message, the base station decides the optimized relay node and its transmit power for the multiple-hop relay system. Finally, the base station starts transmitting the information to the receiver. Figure 1 shows m relays that intervened in the MIMO relay system. Let M, N, and K i (i=1,…, m) denote the number of the antenna at TX, RX, and RS i , respectively. The distance between each transceiver is denoted by d i (i=0,…, m). The distance between TX and RX is fixed as dtotal. TX and all of the relays employ the amplify-and-forward strategy. Mathematical notations used in this paper are as follows: x and X are scalar variables; x and X are vector and matrix variables, respectively; (·) H is the conjugate transpose. The system model of multiple-hop MIMO relay system. For easy description, TX and RX are also denoted as RS0 and RS m+1, respectively. Since path loss is taken into consideration, the channel matrix is a composite matrix and is modeled as follows: l i , i + 1 H i , i=0,…, m, of which H i represents the channel matrix between RS i and RS i+1, li,j denotes the path loss between RS i and RS j . The path loss is described in detail in the following section. H i is a matrix with independent and identical distribution (i.i.d), zero mean, unit variance, circularly symmetric complex Gaussian entries. We assume that the transmit power of TX (ETX) and the total transmit power of relays (ERS) are fixed and are not affected by the change in the number of relays and antennas at each relay. In order to simplify the composition of relay and demonstrate the effect of optimizing the distance and the transmit power of each relay, we assume that the transmit power of each relay is equally divided into each antenna, and the number of antennas in each relay is the same. Moreover, zero-forcing algorithm is applied in both the transmitter and the receiver. At first, the system is assumed to be controlled and the interference is absent. All relays transmit the signal at the same time, with full allocation time. Hereafter, this system is called the ideal system, and the end-to-end channel capacity of the ideal system is called the ideal end-to-end channel capacity. After that, the interference between every transceiver is taken into consideration, and the specific access control is proposed to obtain high end-to-end channel capacity. where p i represents the transmit power of one antenna of RS i .
E TX = M p 0 , E RS = ∑ i = 1 m M p i .
H = p m l m , m + 1 … p 0 l 0 , 1 | s m | 2 … | s 1 | 2 H m … H 1 H 0 . According to the usage of the system channel matrix H, the multiple-hop MIMO relay system can be analyzed the same as the conventional MIMO system. n system p m l m , m + 1 … p 1 l 1 , 2 | s m | 2 … | s 1 | 2 H m … H 1 n 1 + p m l m , m + 1 … p 2 l 2 , 3 | s m | 2 … | s 1 | 2 | s 1 | 2 H m … H 2 n 2 + … + p m l m , m + 1 | s m | 2 … | s 1 | 2 | s m − 1 | 2 … | s 1 | 2 H m n m + | s m | 2 … | s 1 | 2 | s m | 2 … | s 1 | 2 n m + 1 .
n system n system H = ∑ i = 0 m ∏ j ≠ i m l j , j + 1 p j σ 2 | s m | 2 … | s 1 | 2 I M .
C = log 2 det s m + 1 s m + 1 H n system n system H = log 2 det I M + H H H ∏ i = 0 m l i , i + 1 p i ∑ i = 0 m ∏ j ≠ i m l j , j + 1 p j σ 2 , = log 2 det I M + H H H σ 2 ∑ i = 0 m 1 l i , i + 1 p i .
f m = ∑ i = 0 m 1 l i , i + 1 p i . With the above-mentioned definition of H i , H i H i H ( i = 0 , … , m ) becomes a Gaussian matrix regardless of the number of relays, the distance between each transceiver, and the transmit power of each relay. It means that the end-to-end channel capacity is only restricted by f m . Therefore, function f m can be considered instead of the end-to-end channel capacity. In order to achieve the high end-to-end channel capacity, the function f m has to be minimized. l i , i + 1 = λ a d i W i 4 π d i 2 . According to the new type, the path loss becomes a function of the distance only. Additionally, the Taylor expression is applied into the term a d i W i , and then the path loss becomes an equation of higher degree of the distance. Therefore, the distance can be optimized easily by the mathematical method or the particle filter method that be explained in the following section. f ( m ) = σ 2 + ∑ i = 1 m l i − 1 , i + 1 p i − 1 + ∑ i = 0 m − 2 l i + 1 , i + 2 p i + 2 ∑ i = 0 m l i , i + 1 p i . In comparison with the ideal end-to-end channel capacity, the term of interference ∑ i = 1 m l i − 1 , i p i − 1 of the forward link and ∑ i = 0 m − 2 l i + 1 , i + 2 p i + 2 of the backward link is added. Similar to the case of the ideal system, the transmit power and the distance can be optimized by mathematical method [13, 14]. However, the optimization distance of the system with difference W i , especially if the system has interference, is complicated. In order to easily optimize the distance and the transmit power simultaneously, the particle filter algorithm is applied. In this section, we propose the particle filter (PF) method to optimize both the distance and the transmit powers simultaneously for high end-to-end channel capacity. The algorithm is shown in Figure 2 and explained as follows. d = [ d 0 , … , d m ] , E = [ E TX , E 1 , … , E m ] . Step 1: 10,000 × random samples of d and E are generated. The function f for each sample is calculated, and the minimal value f of all samples is denoted by minf. The sample of d and E which has minf is called the optimal sample. Step 2: 10,000 × samples of d and E are generated around the optimal sample by random function. The function f for each sample is calculated and is compared to minf. Step 3: If there is a function f which is smaller than minf, then minf is renewed and the process returns to step 2. Otherwise, the algorithm is finished. To evaluate the particle filter method, the function f in (14) is calculated with the parameters summarized in Table 1. Figure 3 shows the value of function f where the number of relays is 3 and 10. In the case where the number of relays is 10, the number of samples is changed, i.e., 1,000 and 10,000. As shown in Figure 3, the value of function f decreases when the number of circles increases, and the algorithm is finished when function f reaches the minimum. The minimum of function f is achieved in the system with average W. Therefore, the algorithm can be finished when function f reaches the value of f in the system with average W.
The value of function f that is calculated by particle filter method. 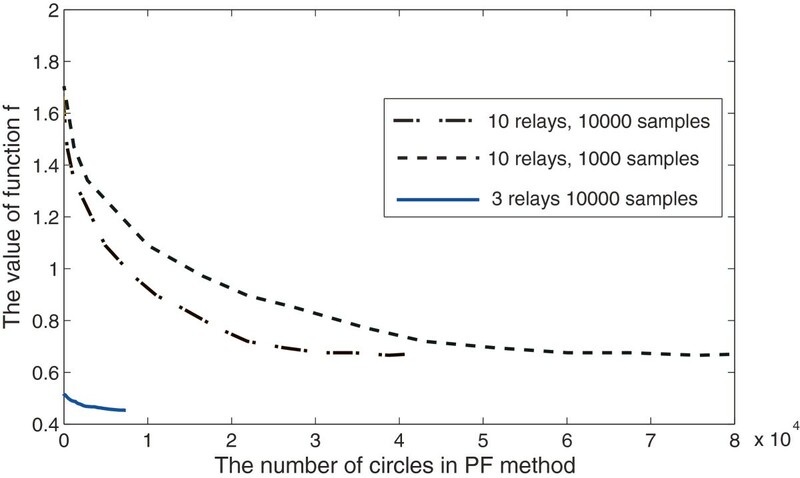 As shown in Figure 3, we can recognize that the number of circles decreases when the number of relays is small and/or the number of samples is larger. However, the PF method requires a large number of samples to converge. If the number of samples is not enough, then the algorithm would not converge or it would take a huge number of circles. The system parameter is summarized in Table 1. In order to evaluate the optimization of distance and transmit power. We assume that all relays are arranged in a straight line from the TX to the RX; the transmit power of the RX and the total transmit power of all relays are fixed. Comparing the end-to-end channel capacity of the ideal system and the system that has interference. In this paper, the transmission protocol of all relays is assumed to be controlled on time domain. 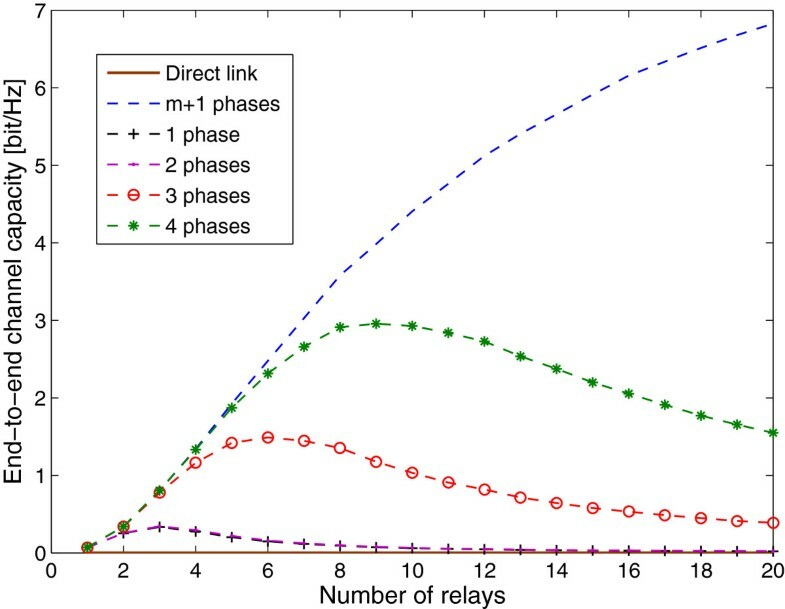 The transmission of all relays is divided into multiple phases of time domain. The relay in the same phase transmits the signal in the same allocation time that is denoted by t i . The other relay that will be divided into different phases keeps the silence or receives the signal. Since the neighbor relay transmits the signal in different phases, the interference signal is weaker than that of the system that has no control. Therefore, the end-to-end channel capacity can be respected to be higher. Figure 5 shows two and three phases of transmission protocol. The two-phase transmission protocol is explained as follows. The even-number relays and the odd-number relays transmit the signal in phases 1 and 2, respectively. Therefore, in the two-phase transmission protocol, the closest interference relays of the backward and forward links to RS i are RS i+1 and RS i−3, respectively. 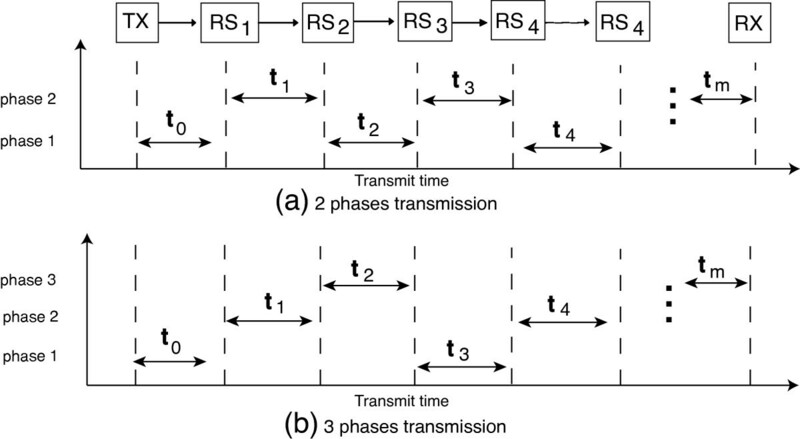 Two-phase (a) and three-phase (b) transmission protocol. f ( m ) = σ 2 + ∑ i = 1 m + 1 − n l i − 1 , i + n p i − 1 + ∑ i = 0 m − 1 − n l i , i + 1 + n p i + 1 + n ∑ i = 0 m l i , i + 1 p i . Compare the interference component of the system, it has no control (14) to that of the system with n-phase transmission protocol (16), the distance from the interference relay is longer, and the number of interference relay is also larger. Hence, we can say that according to the control on MAC layer, the power of interference decreased; thus, the end-to-end channel capacity is expected to be higher. The allocation time for each phase is assumed to be 1 s, and the system model is the same as the one mentioned. In order to evaluate the transmission protocol on the MAC layer, the distance between each transceiver and the transmit power of each relay are assumed to be equal. Figure 6 shows the end-to-end channel capacity in case the access of all relay is controlled on the MAC layer. End-to-end channel capacity of the system that has access control on MAC layer. It is compared to the channel capacity of the direct link. For all cases, such as in phases 1 to 4, we find the optimum number of relays which achieves the highest end-to-end channel capacity. The reason is that, similar to the ideal system, when the number of relay increases, the distance between each transceiver becomes shorter; thus, the power of desired signal increases and the end-to-end channel capacity increases. However, the interference signal is taken into account. When the number of relays is small, the distance between each transceiver is large; therefore, the power of interference signal is low and the end-to-end channel capacity is high. Moreover, when the number of relays is large, the power of interference signal increases. Therefore, the signal-to-interference noise ratio (SINR) decreases, and the end-to-end channel capacity decreases. The end-to-end channel capacity of one-phase and two-phase transmission protocols is almost the same. The reason is that, compare to two-phase transmission protocol in Subection 4.1, in one-phase transmission protocol, the closest interference relays of backward link and forward link to RS i are RS i+1 and RS i−2, respectively. Therefore, the power of interference signal to each relay in both phase transmission protocols is almost the same. The optimum number of relays and the highest end-to-end channel capacity are different for each phase. Since the power of interference signal decreases when the number of phases increases, the end-to-end channel capacity of the higher number of phases is higher than that of lower number of phases. In order to evaluate the multiple-hop relay system, the system without relay node, meaning the direct link from the TX to the RX, is taken into consideration. In the case of direct link, the transmit power of TX is 200 mW (the sum of transmit power of TX and all relay nodes); the other parameters are the same as those in the multiple-hop relay system (Table 1). The channel capacity of direct link is 6×10−4 bit/s/Hz, which is much smaller than that of the multiple-hop relay system (Figure 6). The reason can be that the signal power is reduced by the distance to the power of 2 and the number of reflections; compared to the direct link, the distance of the multiple-hop relay system is shorter and the number of reflections is smaller. Therefore, although the interference signal is present, the SINR of the multiple-hop relay system is higher than the SNR of the direct link. Since the channel capacity of direct link is much smaller than that of the multiple-hop relay system in the proposed propagation environment, hereafter, only the channel capacity of the multiple-hop relay system is considered. However, the delay time of each scenario should be considered. The delay time is defined as the delay of transmitted signal to the RX compared to the original MIMO system (the direct link). The delay time of the signal transmitted from the TX to the final receiver RX is described in Figure 7. 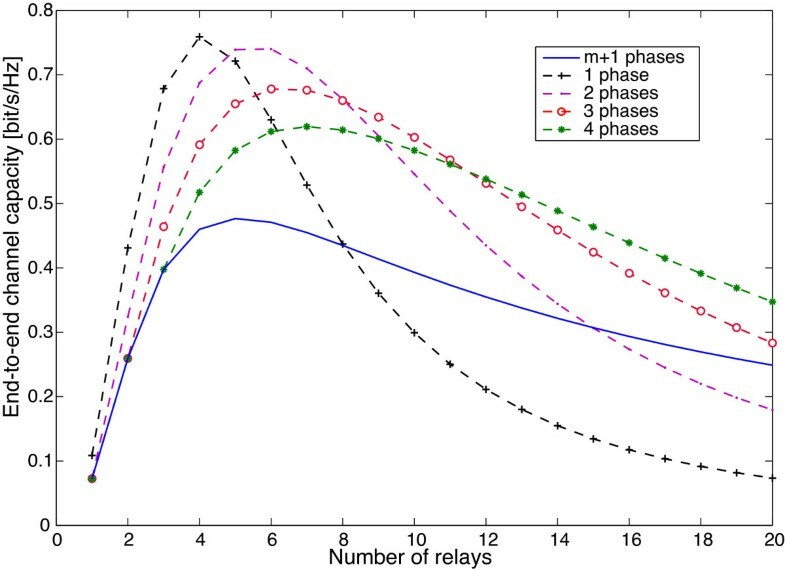 We can recognize that the delay time increases when the number of relays as well as the number of phases increase. It is the trade-off between the end-to-end channel capacity and the delay time. Delay time of multiple-hop relay system for each protocol on the MAC layer and direct link. As shown in Figures 4 and 6, the end-to-end channel capacity of the system that has control on the MAC layer is higher than that of the system that has no control. However, it is smaller than the ideal end-to-end channel capacity. In order to obtain the higher end-to-end channel capacity, the distance and the transmit power should be optimized based on each transmission protocol on the MAC layer or the MAC-PHY cross-layer. For MAC-PHY cross-layer, for each transmission protocol on the MAC layer, the distance and the transmit power are optimized simultaneously by particle filter method (Subsection 3.2). The allocation time for each phase is assumed to be 1 s, and the system model is the same as mentioned. The end-to-end channel capacity of the MAC-PHY cross-layer is shown in Figure 8. The end-to-end channel capacity of MAC-PHY cross-layer. Similar to the system that only has control on the MAC layer, there is the optimum number of relays which achieves the highest end-to-end channel capacity and the trade-off of channel capacity-delay time. However, comparing to the system that has equal distance and transmit power (Figure 6), the end-to-end channel capacity of the system with MAC-PHY cross-layer is much higher. Up to now, since the transmission of relay node is assumed to be isotropic, there is the interference from both forward link and backward link. However, the MIMO relay node can use the beamforming technique to transmit the signal to the next relay. It means that the signal is transmitted to the forward link only and that the interference from the backward link is absent. Figure 9 shows the end-to-end channel capacity of system that only has the forward link interference. The end-to-end channel capacity of MAC-PHY cross-layer that only has forward link interference. As shown in Figure 9, the end-to-end channel capacity increases when the transmission phase increases. Additionally, the trade-off of the channel capacity-delay time can be applied to this scenario. However, comparing to the system that has interference from both forward link and backward link (Figure 8), the end-to-end channel capacity of the system that only has the forward link interference (Figure 9) is much higher. It means that there is the trade-off between complication and channel capacity. The beamforming of MIMO can be applied in the scenario that the higher channel capacity is requested and that the device is large enough to equip the MIMO beamforming. 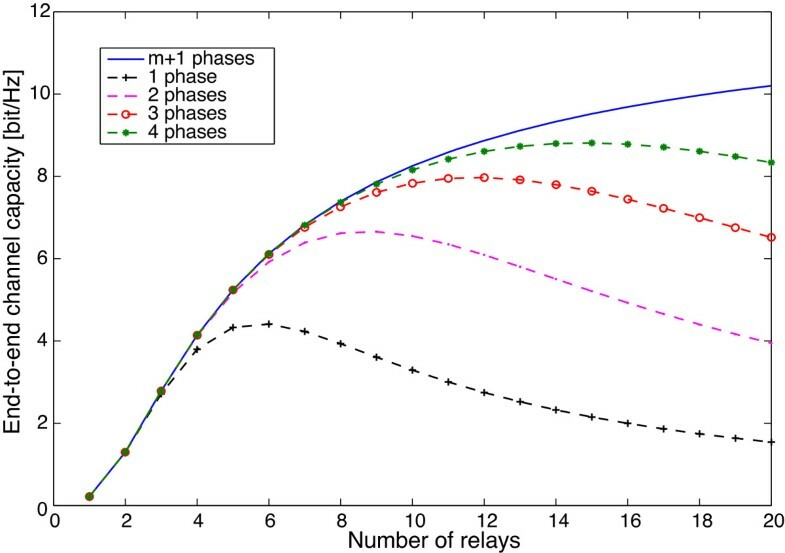 Up to now, the allocation time of each phase is assumed to be 1 s. Thus, there is the trade-off between the channel capacity and the delay time. However, when the transmission time is normalized, it means that the time to transmit the signal from the TX to the final receiver RX is fixed at 1 s and the allocation time of each phase is changed, depending on the number of phases. 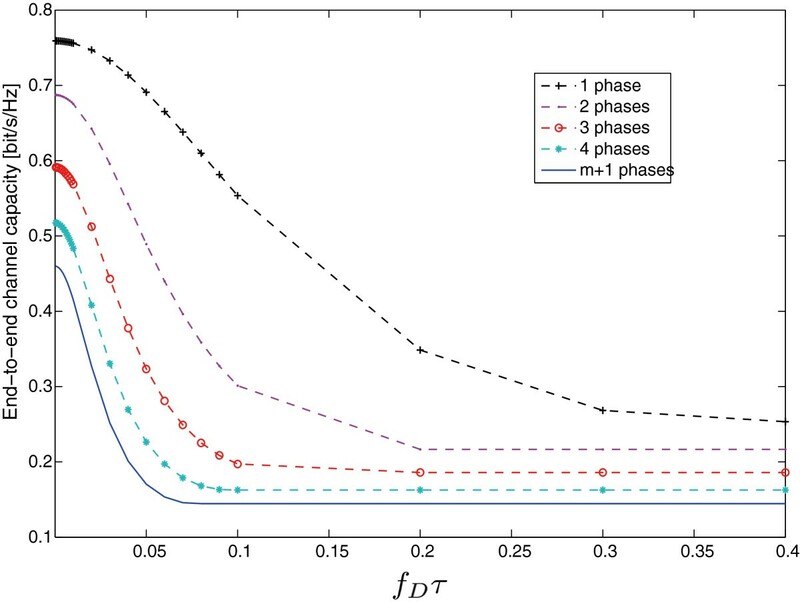 The larger the number of phases, the smaller the allocation time of each phase becomes. 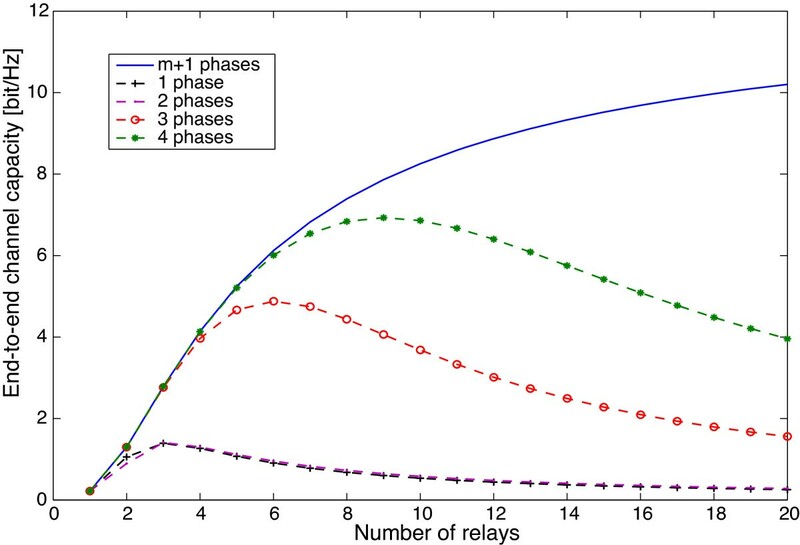 The system model is the same as mentioned, and the relationship between the end-to-end channel capacity and the number of relays when the transmission time is normalized, as shown in Figure 10. In this system, we also assume that MIMO beamforming is applied for all relays; therefore, only the interference from the forward link is taken into account. End-to-end channel capacity of the system that has optimization on MAC-PHY cross-layer when transmission time is normalized. As shown in Figure 10, there are the optimal numbers of relays in the sense of maximal end-to-end channel capacity of each number of phases. Additionally, the maximal end-to-end channel capacity and the optimal number of relays are changed, depending on the transmit power of TX, the total transmit power of RS, the transmission environment (W), and so on. In the case where the number of relays is small, the optimization of the system has no control on the MAC layer (all relays transmit the signal at the same time, one phase) which can reach the higher end-to-end channel capacity than in other scenarios. Moreover, in the case where the number of relays is large, the higher number of phases can obtain the higher end-to-end channel capacity. Hence, to obtain the high end-to-end channel capacity, the appropriate number of relays, the number of phases, and so on should be adopted. Up to now, the performance of the system is analyzed under the assumption of a perfect CSI at both the transmitter and receiver. However, in actuality, the perfect CSI assumption is not always practical due to channel estimation errors, feedback channel delay, and noise. Compared to channel estimation errors, the CSI imperfection introduced by feedback channel delay is sometimes more significant and inevitable. where H ̂ i denotes the outdated channel matrix while H i is the true one. s i t = E ̂ i t s i .
s i + 1 = ( E ̂ i + 1 r ) H s i + 1 r , = ( E ̂ i + 1 r ) H H i β i E ̂ i t s i + ( E ̂ i + 1 r ) H n i + 1 , = ρ D ̂ i + 1 β i s i + k ( E ̂ i + 1 r ) H H ̄ i β i E ̂ i t s i + ( E ̂ i + 1 r ) H n i + 1 .
for the system that has interference from both forward link and backward link. for the system that has interference from only forward link (using MIMO beamforming). Compared to the system that has perfect CSI at both the transmitter and the receiver (14), in the end-to-end channel capacity of the system that has outdated CSI at the transmitter (25), the co-channel interference by outdated CSI is added. The distance and the transmit power of the outdated CSI system is optimized by particle method (Subsection 3.2). The system model is the same as the one mentioned. The parameter is summarized in Table 1. As explained, the end-to-end channel capacity is changed depending on the number of relays. However, in this section, the end-to-end channel capacity, depending on the outdated CSI, is examined. Therefore, we fix the number of relays. Figures 11 and 12 show the end-to-end channel capacity of the system that only has the interference from the forward link (using the MIMO beam forming) where there are four numbers of relays. 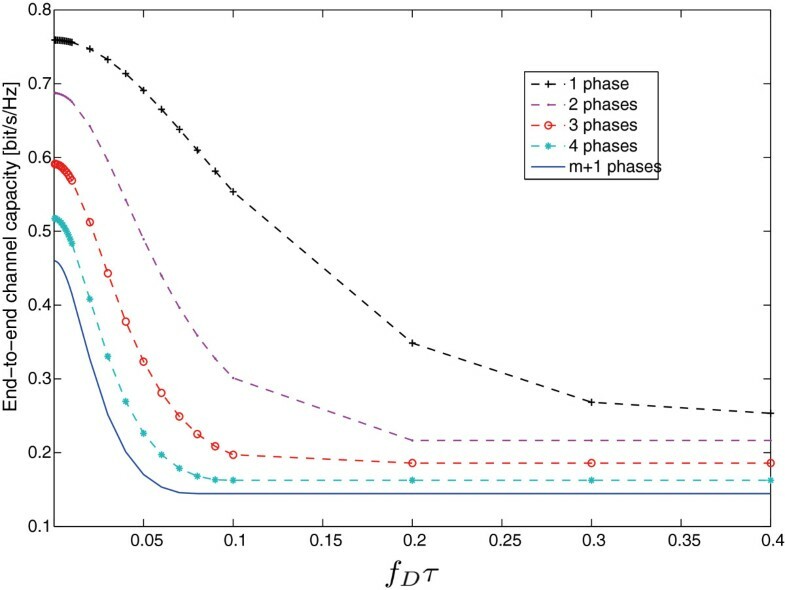 The end-to-end channel capacity of the system in the case where the transmission time is normalized is shown in Figure 12. The end-to-end channel capacity of outdated CSI system that only has forward link interference. There were four relays. The end-to-end channel capacity of outdated CSI system in the case where transmission time is normalized. There were four relays. As shown in Figures 11 and 12, the end-to-end channel capacity is decreased when the term f D τ increases. It can be explained that when the term f D τ increases, the power of interference signal is increased; therefore, SINR decreases. The decrease of end-to-end channel capacity in each number of phases is different regardless of how large the end-to-end channel capacity is in the case of the perfect CSI system. The higher the number of phases, the larger the delay time becomes. 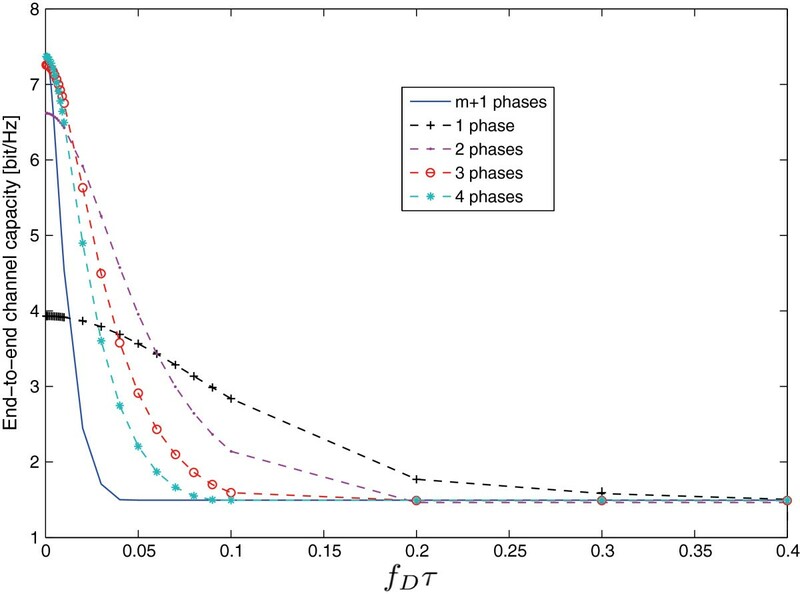 Therefore, the end-to-end channel capacity of the system has the higher number of phases that decreased more rapidly. It means that the one-phase transmission protocol is the most robust regardless of the number of relays. Figure 13 shows the end-to-end channel capacity of eight relay systems. 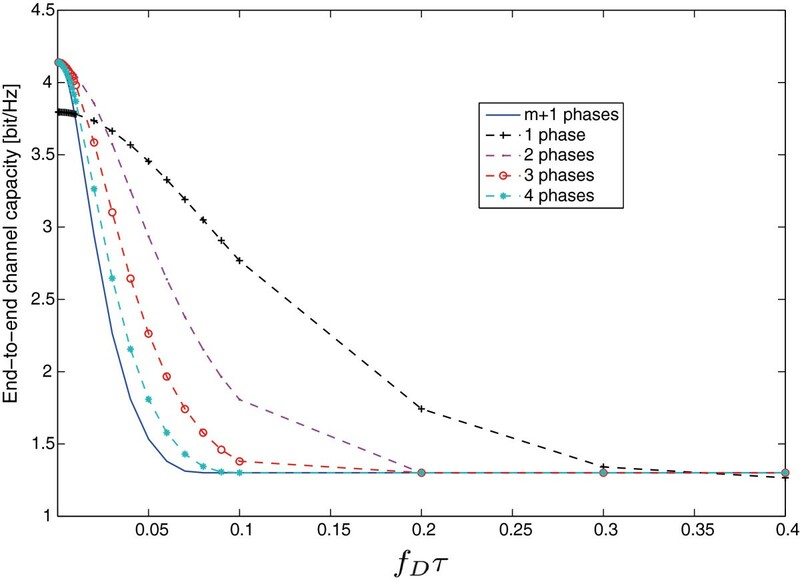 Although the end-to-end channel capacity of the one-phase system in the case of the perfect CSI (or when the term f D τ is small) is lower than that of the higher number of phase systems, it becomes higher than the other higher number of phase systems when the term f D τ increases. The end-to-end channel capacity of outdated CSI system that only has forward link interference. The were eight relays. 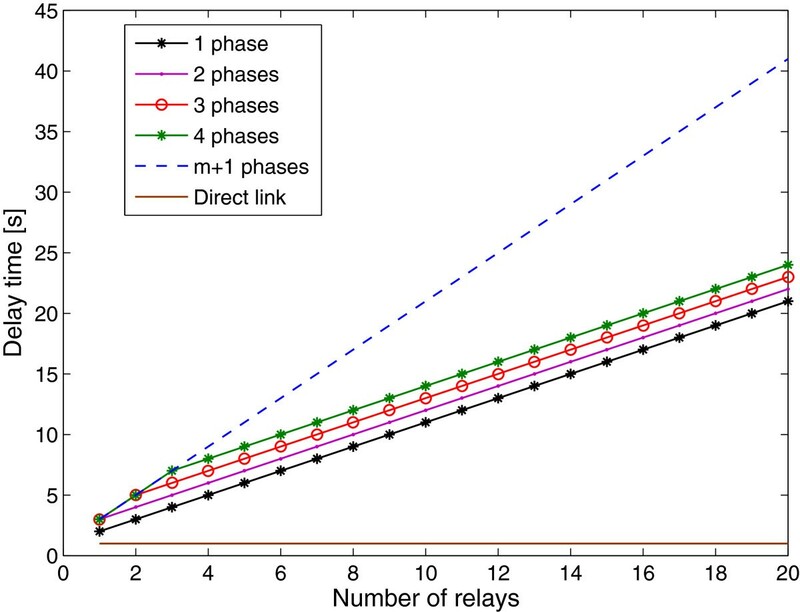 In this paper, we analyzed the end-to-end channel capacity of multiple-hop MIMO relay system with MAC-PHY cross-layer. Compared to the system that has no control on the MAC layer, the end-to-end channel capacity of the system that has control on the MAC-PHY cross-layer is higher. It means that the trade-off of channel capacity-complication is indicated. There is the optimum number of relays for each access control on the MAC layer that achieves the maximal end-to-end channel capacity. However, there is the trade-off between channel capacity and delay time. The system with outdated CSI is also analyzed, and the end-to-end channel capacity of the low number of phases is more robust than that of the higher number of phases regardless of the number of relays. However, in this paper, the ergodic channel capacity has been analyzed, and we only proposed the MAC layer protocol; the appropriate modulation and code word were not considered. In the future, real-time channel capacity, the appropriate modulation, and code word will be examined. In addition, the optimal combination of the MAC layer and physical layer will be analyzed.